We were hanging out on Sunday enjoying the snow and I got to thinking about how long it had been since I put on my cocktail thinking cap and started pondering what I’d like to mix up. 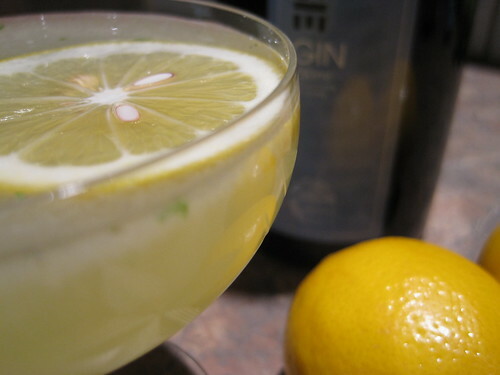 I had meyer lemons left over from a recipe we made on New Year’s Eve and I wanted to mix up a cocktail that would play off their complex and subtly sweet flavors. I was originally thinking whiskey as the base, but decided it would be too strong. Then I landed on gin and shortly there-after realized there was already a classic cocktail, the Southside, based on gin, lemon and mint. Thinking time is over…mixing time begins. The recipe for the Southside that I found in The Joy of Mixology called for muddling the mint, sugar and lemon. I didn’t want the mint to be the star so I opted for a different tact. Toss all the ingredients in a shaker, give it a few solid shakes, but don’t shake the hell out of it, strain and enjoy. Very tasty and really great to be mixing up cocktails again. Let’s do more of this, shall we. As far as spirits go, vodka does not have much character. A really good vodka will taste only of clean alcohol with very little else to distinguish it. One way to add character would be to flavor it, but those who have shopped with me (Elisabeth especially) know how horrified I am by the flavors of vodka on the market — whipped creme? toasted marshmallow? Yeah…no. 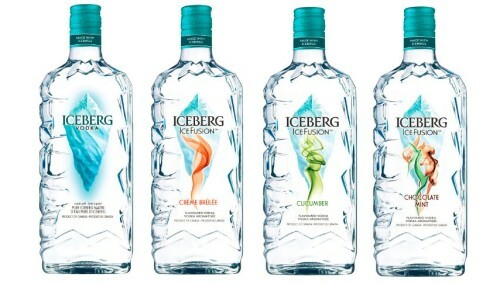 Iceberg Vodka from Canada recently sent me four vodkas to taste: their regular unflavored vodka and cucumber, creme brulee and chocolate mint flavors. The regular vodka (40% ABV) smells and tastes like a pure vodka should, with no aromas and no lingering flavors on the palate. Very clean, crisp and drinkable. The cucumber vodka (35 % ABV) has a slightly off scent — more like cucumber peels, rather than the crisp scent you would expect from a peeled cucumber. It does taste cucumbery. Elisabeth didn’t find this flavor appealing at all, although she is not a cucumber lover either. I think this could be a really interesting vodka for a Bloody Mary or Dirty Martini. For an interesting twist, you could add this to a Pimm’s Cup or a twist on the traditional vodka tonic, perhaps. The creme brulee vodka (35% ABV) had a great buttery caramel vanilla aroma reminiscent of custard fresh out of the oven. The vodka comes off as slightly sweet with a toffee-like flavor that is fairly subtle. This vodka does not have an overpowering or fake flavor, as so many other creme brulee/toffee liqueurs will. It would be a great addition to hot chocolate, although its subtle flavor may be lost if you mix it with it an ingredient that’s strongly flavored. The chocolate mint flavor (35% ABV) smells just like an Andes Mint. Elisabeth tasted this one first, and almost refused to let me have any. The vodka is definitely reminiscent of Andes Mints: not overly sweet with well balanced chocolate and mint flavors. Again, this would work great in a hot chocolate, but why not add to a mudslide or something similar for a little minty kick. Overall, these were pretty tasty flavored vodkas. Cucumber vodka, like most savory infusions, will be the most difficult for me to use. The Iceberg Vodka website also had great suggestions for cocktails based on all the different flavors. So, am I a flavored vodka convert? Probably not. I’ll still reach for gin more often than a flavored vodka. But, if you’re looking for a unique twist on a traditional vodka cocktail these might be just what you’re looking for. Big thanks to Elisabeth for co-writing (and co-sampling) this post with me!